Plug-Ins: "Plug-in Repair Duplicate Elements" (OotB) - Open Text Web Solutions Usergroup e.V. Duplicate elements in a page based on same content class element could have been created in older versions before or equal to version 10 by publishing a page in parallel (by publishing multiple language or project variants) after a new element has been created in a content class. The duplicates can be seen in SmartTree but not in a page preview/SmartEdit. 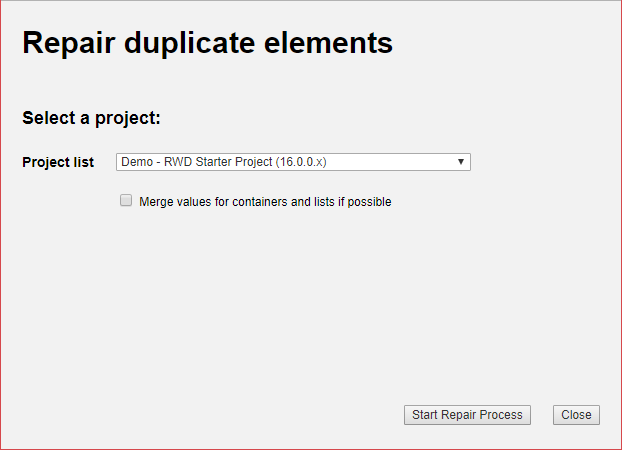 The Repair Duplicate Elements tool, that has already been available as a support tool, has been converted to a plug-in. It is available with a standard installation of Management Server. Which problems can be resolved with the tool? How to install the plug-in? The plug-in can be installed in Plug-In administration in Server Manager. The node Server Manager/Administer Projects/Projects node is preconfigured as default target and should not be changed. Select the project which should be repaired. The option "Merge values for containers and lists if possible" can be selected for merging of all pages from duplicated lists or containers to one of this elements. In a first step, the plug-in resolves all duplicate issues that can be resolved automatically. Duplicate content elements are automatically deleted if the values of the elements are redundant or empty. All language variants will be checked. If for example the value of one duplicate in language variant A is empty and for language variant B it is not empty, and for another duplicate the opposite is true, no duplicate can be automatically deleted. Duplicated structure elements without pages or links connected, will be automatically deleted. If duplicate structure elements are connected to the same set of pages or if one of them is connected to a subset of pages of the other element, the duplicated elements will also be automatically repaired. With the option "merge values for containers and lists if possible" selected, values of structure elements will be combined in one element if possible. The process of automatic deleting duplicate elements can take several minutes or, depending on the project size, even up to some hours. elements that cannot be repaired. It is possible that not all content elements can be repaired automatically, for example if element value differs for one or all languages. Those elements can be repaired manually. In a second step, the user is guided to resolve the remaining issues manually. The plug-in lists duplicates that need to be handled manually, so that the user can decide which duplicates should be deleted. The decision should be done based on expectation or current preview of the page with the duplicate element. Only content elements can be repaired this way. Duplicated structure elements that cannot be automatically deleted cannot be repaired with this tool. It is necessary to manually repair those duplicates in SmartTree and run the plug-in again for final checks. Before executing the plug-in for a project, it is recommended to create a database backup of the project. During the execution, no user or tool should work on the project and it should be locked for everyone. If possible, do a full site publishing before the execution of the plug-in. After executing the plug-in for a project, clear the page cache in the project and do another full site publication. Check all changed pages or check the differences of all pages, manually or with a comparison tool.